Politically indifferent – and proud? Working out at night is not ideal – it can be difficult to muster energy after the sun goes down and when the rest of your family is going to bed. But if there is one advantage, it’s the availability of sports on TV. Nothing makes a run go faster than a compelling game, and the last few months have been fantastic, starting with the NBA playoffs, through the Olympics and now to the U.S. Open leading into the football season. But Tuesday night, I was unable to watch tennis at the gym. Why? Because three of the five TVs were tuned to the Republican National Convention. My first instinct: Eye roll. Good grief. Who cares? Politicians are all the same – crooked and unable to implement positive change. I completed a 5K on Sunday – the second one I’ve done. Running 3.2 miles doesn’t sound like much – especially on a picture-perfect fall day – and it wasn’t. In this case, the impetus was to raise money for charity rather than to break any land-speed records. Still, I prefer to do well in most ventures and this was no exception, particularly since I work in a semi-athletic arena and see myself as something of an athlete having played several sports in high school (tennis, baseball, basketball, golf) and one (briefly) in college. The race results: a new personal-best time of 23:57 and a spot in the top-10 percent in a field of 575. That’s despite twice having to stop to retie a shoe and rarely training outdoors. (I’m a self-proclaimed treadmill chump; that will change as soon as Mother Nature starts hanging flatscreens.) Decent, right? Not upon further review. Turns out I got beat by two 11-year olds, two 60-year olds, five older women and one U.S. Senator (John Thune). Plus, I finished only in the top third of men ages 30-35. Plus, my right calf muscle/Achilles is still swollen and sore days later that I walk with a limp (as opposed to walking with a swagger like Tom Green). See, in my mind, I still think I’m a fair athlete – reasonably fast, strong and coordinated. I work out six days a week and have roughly the same body composition I did upon finishing college a decade ago. But this race was a walk-up call: I’m probably lying to myself about my fitness level. What’s more, I may be getting older, jogging toward death at roughly 7:43 per mile. The idea of overestimating my physical ability is probably not uncommon. For starters, most of us think we’re better than pretty much everything than we actually are. 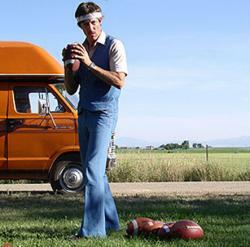 Plus, every male has a little bit of Uncle Rico in him. "We could have won state." Still, did not see this coming. At least, not yet. Sure, I could train a little harder and eat a little better and I don’t have a ton of race experience, which I’ve come to learn does matter. But, again, it’s not like I’m a total slug and haven’t yet hit the age (34?) where men start to leave their physical prime. I blame some of my distorted self-view on my job. If you spend enough time around college athletes, you start to lump yourself into that group in terms of fitness. (I’m willing to bet the same goes for people who hang around models or musicians – you start to see yourself as that to a certain extent.) But that, it turns out, is a lie. The truth is this: I’m not in excellent shape; I’ll have to settle for good. I’m not young; I’m merely not old. I’m not an athlete; I just write about them on the InterWebs. Guess I’m going to have to rely on my intellect from here on out. It’s too that a blob of brain matter doesn’t look as good as toned arms in sweat-wicking shirt.